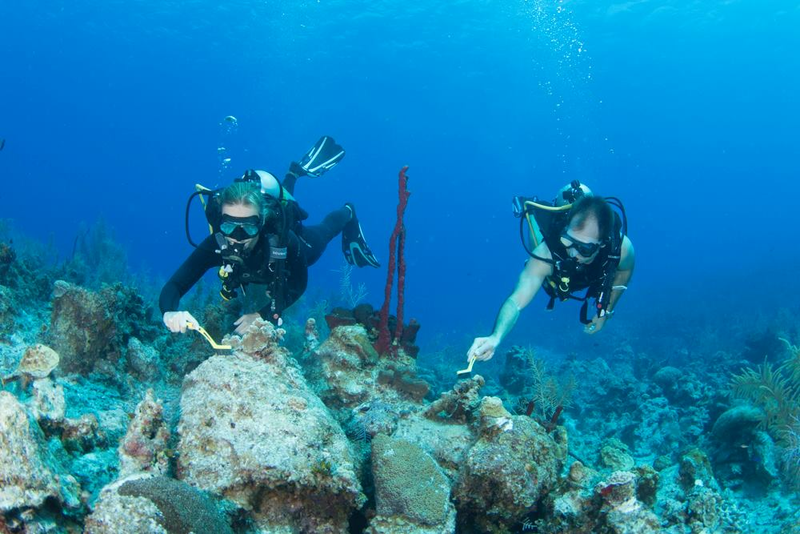 Dive volunteers in Grand Cayman are carefully combing a section of restored coral reef in George Town Harbour, scrub brushes in hand, trying to keep reattached coral fragments free of threatening algae to make them more attractive when local corals spawn next month. An experienced coral restoration specialist, Hatcher and a core group of local volunteers, supported by dive operators and the local community, have spent hundreds of hours on the project over the past two years. A fundraiser brought in $28,000 for the project and Carnival Cruise Lines also donated US $100,000 without admitting fault. During coral spawning, corals simultaneously release eggs and sperm to make new life in the water. These fertilized eggs, or gametes, ride the currents until they find a spot to descend and start new coral colonies. The annual event, which happens in the middle of the night, is more predictable these days, so Hatcher says timing is everything during spawning and too much algae can interfere with this reproductive cycle. The world’s coral reefs are under attack by global warming, massive bleaching events, pollution, invasive lionfish and other factors. Hatcher and her small team of volunteers continue to do what they can to restore the balance in this particular ecosystem in the Cayman Islands. For her work with this coral restoration project and the new Cayman Coral Nursery Program, Lois Hatcher, a photo pro with Ocean Frontiers, has received a Stingray Award for Watersports Employee of the Year from the Cayman Islands Tourism Association. Joey Avery who spent many hours working side by side with her underwater at the restoration site says it is well deserved. “She walks the walk in a world where so many just talk the talk,” said Avery. The Magic Reef Restoration Project continues to give local divers a chance to get involved with maintenance work at the site, and Lois Hatcher says there are still two coral trees with 100 coral colonies that need to be out-planted. Volunteers are still needed and dive industry leaders say personal involvement is key to conservation. Offering diverse and wide-ranging dive programs on both Grand Cayman and Little Cayman, the members of this dive group represent the best Cayman has to offer.